CANBERRA, Australia -- A 2-month-old made history in Australia - becoming the first baby to be breastfed in Parliament. The little girl, named Alia Joy, is the newborn daughter of Queensland Senator Larissa Waters. Waters, co-deputy leader of Australia's Green party, returned from maternity leave Tuesday, with her second daughter in tow. When Alia Joy was hungry, she fed her. 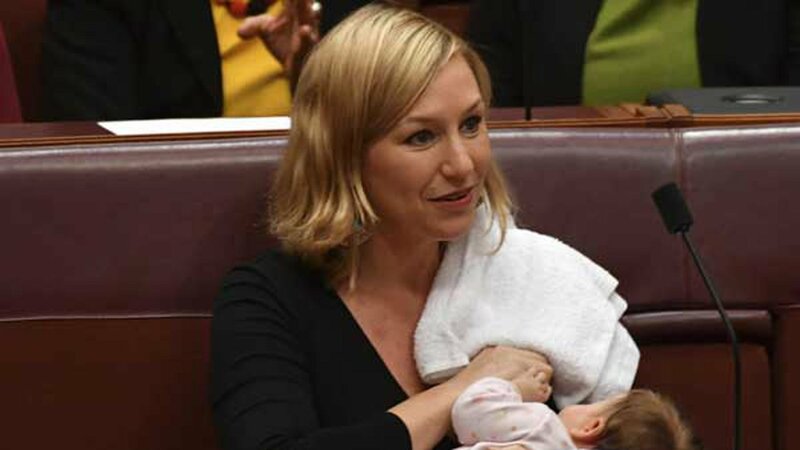 "So proud that my daughter Alia is the first baby to be breastfed in the federal Parliament!," Waters tweeted. "We need more #women & parents in Parli." The Australian Parliament changed its rules last year to allow female lawmakers to nurse their infants in the chamber. Before that, children were banned from the chamber. And breastfeeding mothers were given a proxy vote. Waters, who was influential in the rule change, said in November, "If we want more young women in Parliament, we must make the rules more family friendly to allow new mothers and new fathers to balance their parliamentary and parental duties." On International Woman's Day, while Waters was still on maternity leave, the senator announced the birth of her daughter and hinted about what was to come. "(Alia) is even more inspiration for continuing our work to address gender inequality and stem dangerous climate change. (And yes, if she's hungry, she will be breastfed in the Senate chamber)." Alia isn't the first baby to be fed during political proceedings. In 2016, a politician in Iceland breastfed her one-month-old child while speaking at the national parliament. In what the Icelandic National Broadcasting Service called a first, Unnur Brá Konrásdóttir, an MP for the Independence Party, fed her baby during a debate on the proposed Foreigners Act.